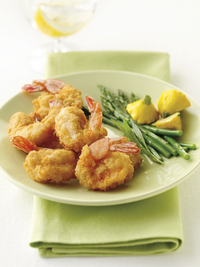 OCEANWAY® DINNER SHRIMP 21/25 CT.
By: Oceanway From: King & Prince Seafood Corp. 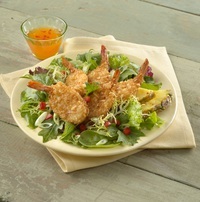 These value-priced, peeled and deveined shrimp are butterflied and coated with an Asian-style breading for extra crispiness. The partially cleaned tails provide an impressive presentation. Do not thaw. Do not overcook. Fry in clean oil at 350°F/177°C for about 2½ to 3 minutes or until golden brown. By Oceanway from King & Prince Seafood Corp.